This transit was predicted by calculations made by Jeremiah Horrocks and also subsequently observed by Horrocks at Much Hoole, about 10 kilometres south west of Preston, Lancashire shortly before sunset. This was the first successful observation of a transit of Venus. It seems likely that the only other observer of this transit was his friend, William Crabtree, in nearby Manchester. Venus crossed the disc of the Sun on 1639 December 4th. The map above shows the global visibility of the event. The transit could be seen in its entirety from the United States except the extreme north-eastern and north-western parts, central southern Canada, Central America, the Caribbean region except the southern part and South America except the eastern part. The Sun set while the transit was in progress in the grey areas encompassing Africa except the north-eastern part, western Europe including the British Isles and north-eastern Canada. The Sun rose while the transit was in progress in the grey areas taking in the north-western part of North America and the Pacific Ocean including Australasia. The yellow lines on the diagram show the position of the terminator, where the Sun is either rising or setting, at the key phases of the transit. The geocentric circumstances of the transit are shown in the diagram above. During the transit, the diameter of the Sun was 1949.4 arcseconds and that of Venus was 63.2 arcseconds. In other words, the diameter of Venus was 0.03 that of the Sun, making it look like a rapidly moving sunspot. The whole transit lasted just under seven hours. In 17th-century England, the Julian Calendar was still in use and historical records from that period give the date of the transit as 1639 November 24th. In the United Kingdom, the transit began shortly before sunset. 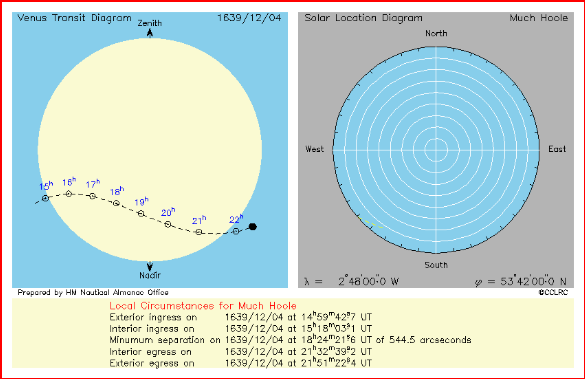 Taking Horrocks' observing site of Much Hoole, near Preston, as an example, the transit began with exterior ingress at 15h00m (UT) when Venus started to cross the solar limb. The Sun was very low in the south-western sky at an altitude of just under 5°. Interior ingress occurred at 15h18m (UT), when the whole of the disc of Venus had crossed over the solar limb. The Sun had reached an altitude of only 3° above the horizon. Observations of the transit were ended just over half an hour later by sunset which occurred at 15h53m (UT). The remaining six hours of the transit were invisible to observers in western Europe. The progress of the transit is summarized in the diagram below. The left-hand panel shows the movement of the Venus across the solar disc. The top of the diagram points to the zenith, the point directly overhead. The position of Venus is marked every UT hour. The right hand panel shows the movement of the Sun in the sky.